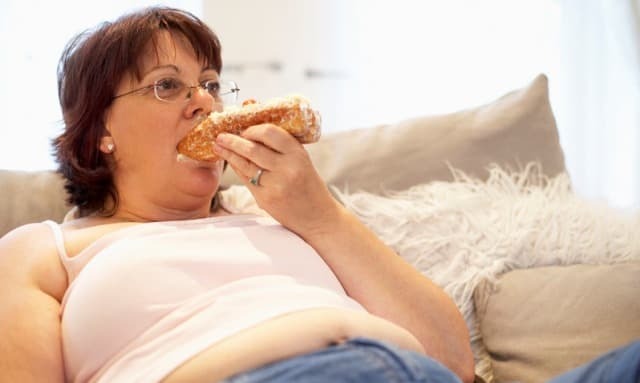 According to the National Association of Anorexia Nervosa and Associated Disorders, approximately 3 million men and 5 million women, or 1 out of every 35 American adults suffer from a Binge Eating Disorder. The disorder has serious effects upon all aspects of one’s life. The information below can help you identify whether you or a loved one has such a condition. Realizing you have a problem is one of the most important steps you can make in the recovery process. If you believe your or a loved one needs treatment and is ready to find a binge eating recovery center, you can call us for help a 1-888-319-2606 Who Answers? . Binge eating can affect people who are overweight, underweight or at a normal body weight. Binge eating can affect people who are overweight, underweight or at a normal body weight. While you might overindulge occasionally such as during the holidays, for example, people with this disorder tend to overindulge on a regular basis. Eating faster when binging than you do when you normally eat. Feeling anxious or depressed after binging. Having no control over when you eat. Hiding your binging from family and friends. Continuing to binge even when resolving to stop. Binging on a regular basis or several times every week. You might find it difficult to learn if a loved one suffers from this condition because the person may only binge in private when no one is around. Looking for signs of food trash or missing food is one way that you can identify potential problems in a loved one. A binge eating recovery program can help stop the cycle. If you or a loved one has symptoms of the disorder that are listed above, it is wise to seek a consultation with professionals that are familiar with binge eating and its treatment. You can call us at 1-888-319-2606 Who Answers? to discuss your concerns. Nutrition counseling, or nutrition therapy, is a key component of rehab and recovery treatment. Such counseling helps implement a healthy eating plan and coping strategies for maintaining the plan. Such counseling can include education about healthy eating and the planning and preparation of healthy meals, for example. Binge eating recovery programs include counseling or therapy sessions in which an individual learns how to change thoughts and beliefs about food and eating. Individual, group and family sessions are common. Medical care is also typically provided to monitor and supervise physical health issues, but often to prescribe medications that are needed for both physical and mental health issues during treatment. The National Institute of Mental Health found that more than 43 percent of all people with a binge eating disorder seek treatment at some point in their lives, meaning that there are others who feel the same way you do. A binge eating treatment facility can teach you the skills you need to overcome your eating disorder and lead a healthy life. Finding help is as easy as calling us at 1-888-319-2606 Who Answers? . You can call at any time for support in finding your options for treatment and in making your decision to enter treatment. We want to help you find the best binge eating rehab program available that specifically meets your individual needs.